Cars can't stop at the lobby of the Cantonment Police Complex due to security purposes. 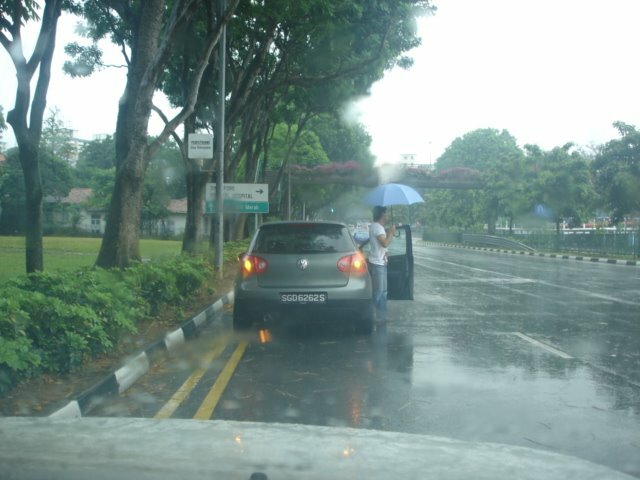 So, cars double parked on South Bridge Road to do their business. 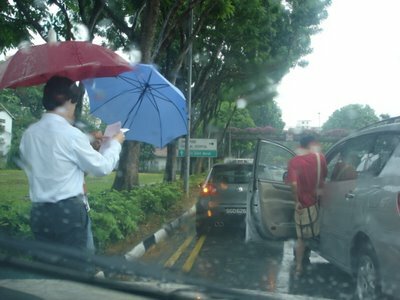 The man with the red umbrella ran all the way from the complex some 50 m away to take some forms from the driver of the first car. This is the de facto alighting and picking up point if you have business in the Cantonment Police Complex. Totally unsafe and illegal. SO and i were pleasantly surprised when we patronised the Cafe Cartel outlet at Marina Square yesterday. Instead of the opening line "May i take your order, Sir? ", we were greeted by CC table service statement. We were told that our dinner would come with table service and it would cost us 10% of our dining bill. The service would entail free cold/hot plain water (a contentious issue that was press fodder recently), free flow of bread & butter and having our dinner served at the comfort of us not having to leave the table. I don't know whether this latest move is mere gimmick or a reaction to the recent bad press on customer service, CC had just upped our satisfaction index. Our only lament was CC could have trained their staff better on the line delivery. The waitress was rushing through her lines and fumbled half way through. She had to repeat twice for us to catch what she meant. 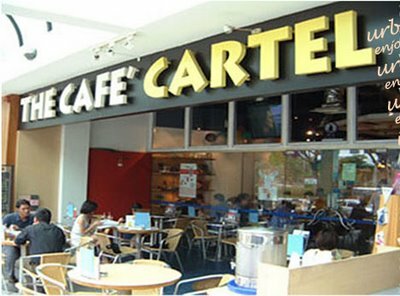 SO and i were pleasantly surprised when we patronised the Cafe Cartel outlet at Marina Square yesterday. Instead of the opening line “May i take your order, Sir?”, we were greeted by CC table service statement. We were told that our dinner would come with table service and it would cost us 10% of our dining bill. The service would entail free cold/hot plain water (a contentious issue that was press fodder recently), free flow of bread & butter and having our dinner served at the comfort of us not having to leave the table. I don’t know whether this latest move is mere gimmick or a reaction to the recent bad press on customer service, CC had just upped our satisfaction index.